Today Glen, Georgia and I went scouting for good birding venues in the Tacambaro region. 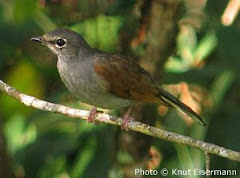 See photos of Birding Sites Tacambaro Region . From Patzcuaro, take the road to Tacambaro. When you reach a T, turn south toward Tacambaro. This T intersection is designated as mile 0 for the following directions to our birding sites. Mile 00.0 - T where you turn south. Mile 05.9 - Road comes to a Y. Go left towards Yuricato. Mile 06.5 - A road on left goes uphill to top of Salto Santa Paula. Mile 06.6 - On left, river route to bottom of Salto Santa Paula. Mile 07.8 - Landmark: large Pemex. Mile 08.3 - Turn left on road to Cerro Hueco. Landmarks at corner are signs that read Taller Perez Velez and CFE (Comisión Federal Eléctrica). Follow road up to Parque Ecológico Recreativo Cerro Burro. Return to main road to continue. Mile 10.8 - Landmark: white building on right - Asociación Ganadería. Mile 12.0 - Turn right onto dirt agricultural road which goes north along Rio Corucha. Easy to miss. On the main road towards Chupio, if you see a cement wall on the right for an irrigation pond, you have missed the turn. The turn for the Rio Corucha site is well before the pueblo of Chupio. Mile 15.9 - Balneario Arroyo Frio. You will drive through the pueblo of Chupio to reach this site. After Chupio, look for a sign on the right to turn into Arroyo Frio. We saw some very good birds. In fact, we all three got lifers. It is difficult to say what was most exciting. We saw the White-breasted Nuthatch, Spotted Wren, Red Crossbill, Rose-throated Becard, Blue-black Grassquit, White-naped Swift and Golden-cheeked Woodpecker, to mention a few... 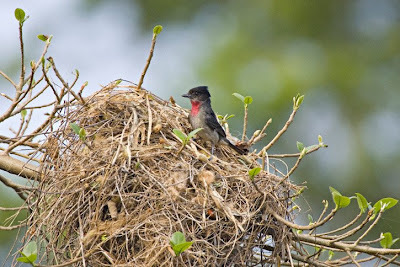 In several instances, we were treated to watch pairs of birds come and go from their nests. Watch http://patzcuarobirder.blogspot.com/ for today's complete bird list.